The cinema did not emerge as a form of mass consumption until its technology evolved from the initial "peepshow" format to the point where images were projected on a screen in a darkened theater. In the peepshow format, a film was viewed through a small opening in a machine that was created for that purpose. 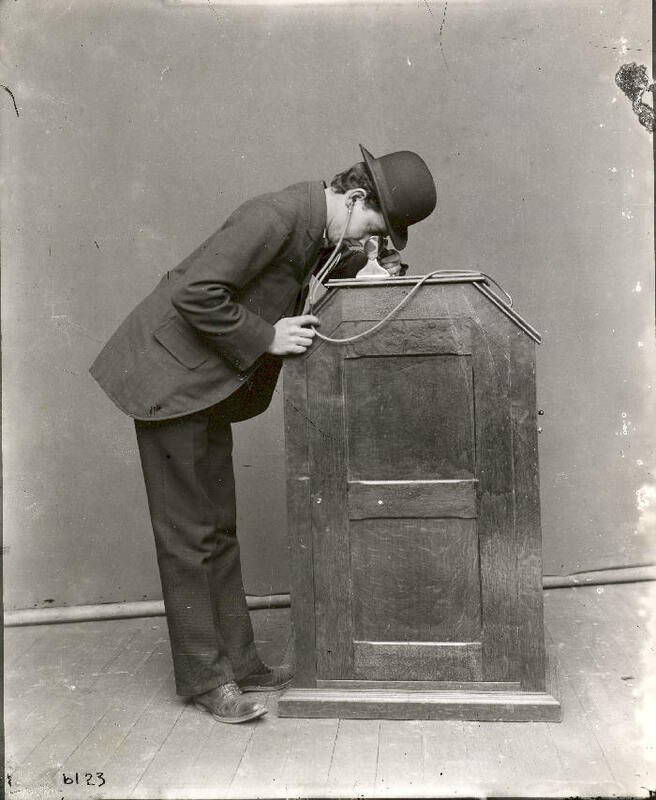 Thomas Edison's peepshow device, the Kinetoscope, was introduced to the public in 1894. It was designed for use in Kinetoscope parlors, or arcades, which contained only a few individual machines and permitted only one customer to view a short, 50-foot film at any one time. The first Kinetoscope parlors contained five machines. For the price of 25 cents (or 5 cents per machine), customers moved from machine to machine to watch five different films (or, in the case of famous prizefights, successive rounds of a single fight). These Kinetoscope arcades were modeled on phonograph parlors, which had proven successful for Edison several years earlier. In the phonograph parlors, customers listened to recordings through individual ear tubes, moving from one machine to the next to hear different recorded speeches or pieces of music. 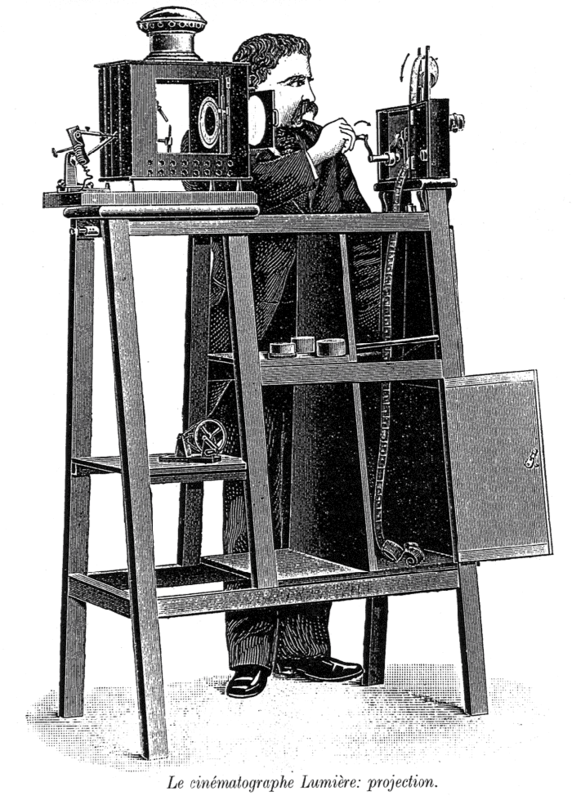 The Kinetoscope parlors functioned in a similar way. 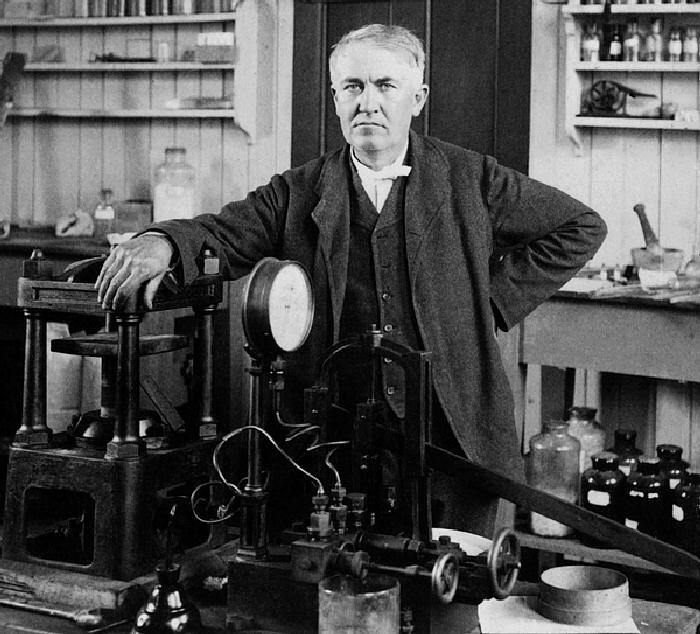 Edison was more interested in the sale of Kineto-scopes (for roughly $1,000 apiece) to these parlors than in the films that would be run in them (which cost approximately $10 to $15 each). He refused to develop projection technology, reasoning that if he made and sold projectors, then exhibitors would purchase only one machine—a projector—from him instead of several. Exhibitors, however, wanted to maximize their profits, which they could do more readily by projecting a handful of films to hundreds of customers at a time (rather than one at a time) and by charging 25 to 50 cents admission. 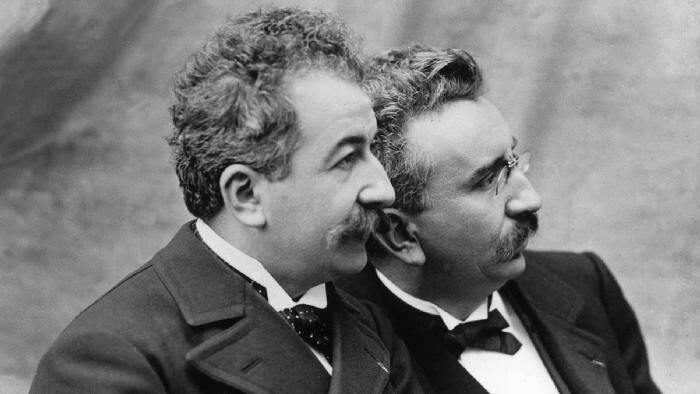 About a year after the opening of the first Kinetoscope parlor in 1894, showmen such as Louis and Auguste Lumiere, Thomas Armat and Charles Francis Jenkins, and Orville and Woodville Latham (with the assistance of Edison's former assistant, William Dickson) perfected projection devices. These early projection devices were used in vaudeville theaters, legitimate theaters, local town halls, makeshift storefront theaters, fairgrounds, and amusement parks to show films to a mass audience. 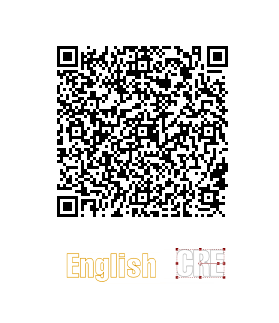 With the advent of projection in 1895-1896, motion pictures became the ultimate form of mass consumption. Previously, large audiences had viewed spectacles at the theater, where vaudeville, popular dramas, musical and minstrel shows, classical plays, lectures, and slide-and-lantern shows had been presented to several hundred spectators at a time. But the movies differed significantly from these other forms of entertainment, which depended on either live performance or (in the case of the slide-and-lantern shows) the active involvement of a master of ceremonies who assembled the final program. Although early exhibitors regularly accompanied movies with live acts, the substance of the movies themselves is mass-produced, prerecorded material that can easily be reproduced by theaters with little or no active participation by the exhibitor. Even though early exhibitors shaped their film programs by mixing films and other entertainments together in whichever way they thought would be most attractive to audiences or by accompanying them with lectures, their creative control remained limited. What audiences came to see was the technological marvel of the movies; the lifelike reproduction of the commonplace motion of trains, of waves striking the shore, and of people walking in the street; and the magic made possible by trick photography and the manipulation of the camera. 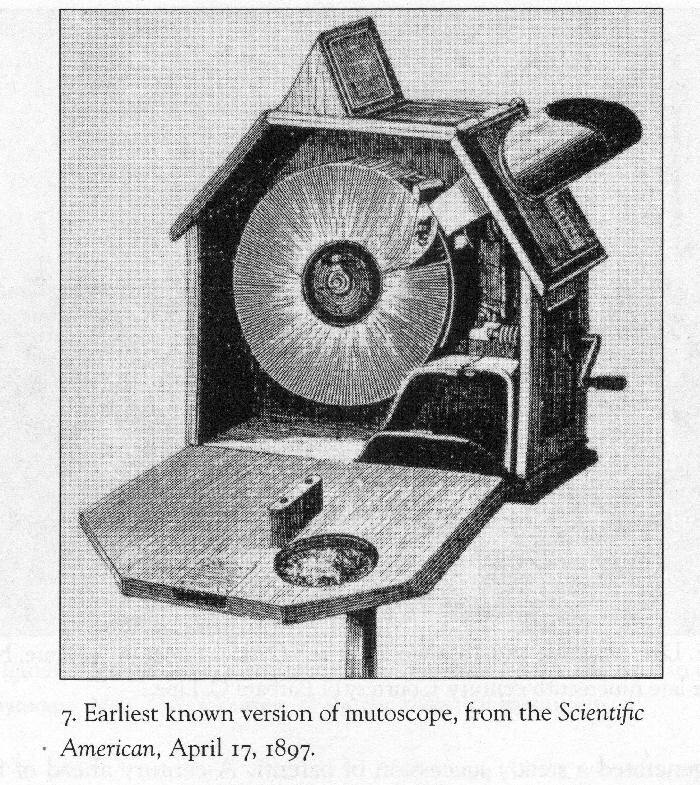 With the advent of projection, the viewer's relationship with the image was no longer private, as it had been with earlier peepshow devices such as the Kinetoscope and the Mutoscope, which was a similar machine that reproduced motion by means of successive images on individual photographic cards instead of on strips of celluloid. It suddenly became public—an experience that the viewer shared with dozens, scores, and even hundreds of others. At the same time, the image that the spectator looked at expanded from the minuscule peepshow dimensions of 1 or 2 inches (in height) to the life-size proportions of 6 or 9 feet.